Matroyshka, or russian nesting dolls, have been quite popular in recent years. Click here for innumerable images and ideas. I really liked a view of their graduating sizes, kind of like this one on my pinterest boards. 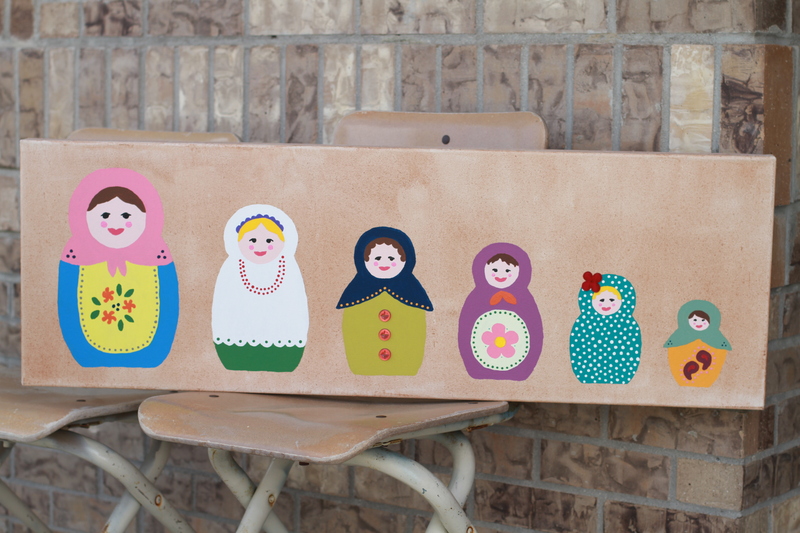 So I painted a long canvas of the dolls and used features of many different prints and images to make each matroyshka unique. This picture is so quiet, there was actually tons of measuring and paper templating and pencil sketching to get the sizing right. It hangs in our up stairs kids and guests bathroom and beams benevolence on all. Matroyshka dolls are very peaceful. The kids like to pick their favorites. The three buttons and one flower are glued on and have dimension. You are currently reading Pinterest project- Matroyshka canvas at whatsarahfound.